Bike Frame Building open house with Paul Brodie had to be cancelled as a result of Paul’s involvement in a motorcycle accident. Paul Brodie has over 25 years of expertise in designing and building bicycle frames. Best known for engineering a sloping-top tube frame that revolutionized the face of mountain biking in Canada, Paul has dedicated his life to building unique bicycles by hand. Paul’s bike frame building class at UFV teaches you all you need to know about tube selection, tube-mitreing, jigs and fixtures, welding/brazing, frame alignment, and finish work. 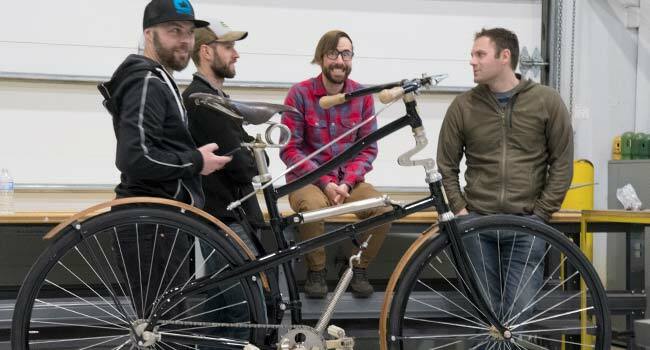 UFV also offers bicycle maintenance classes for hobbyists and those interested in working in a cycle shop.